Some external hard drives that are connected via USB, eSATA or Firewire to a computer system have the annoying habit of going into power saving mode after ten to fifteen minutes of idle time. While this is not problematic at all times, it can become a issue when the device exits that power saving state again as it may cause system-wide lags for the time it takes to power up the hard drive. The first possibility is that the power options are configured to put devices into power saving mode. 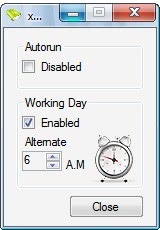 Hard drives in Windows may be configured to enter power saving mode after a certain inactivity period. If that is the case, disabling the functionality may resolve the issue on the computer system. To verify if this is the case, do the following (this is demonstrated using Windows 7, the method may vary slightly on different versions of Windows but it should work on Windows 8 and 10 as well). Press the Windows key, type powercfg.cpl and select the result of the same name or hit enter. Here you find all power plans and the currently selected plan. Click on change plan settings next to the selected plan. 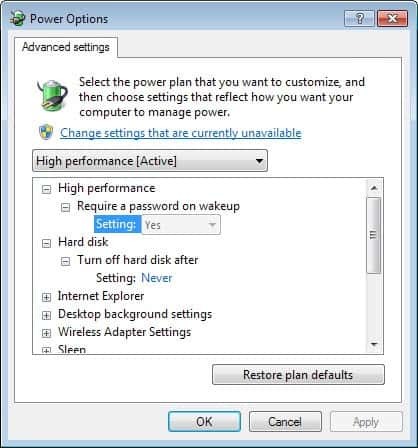 Here you need to click on the change advanced power settings link. Locate Hard disk in the Power Options window and make sure it "turn off hard disk after" is set to never. The second possibility is that the power saving mode is hard-coded in the external hard drive. There is no way of turning that mode off using the Windows operating system. The only possibility in this case is to use third party tools that prevent these external hard drives from going into power saving mode. XSleep is a portable computer software program that can prevent power saving mode of up to four external hard drives. It is a third party solution that blocks hard drives from entering sleep mode, even if there is no internal option to turn off the feature. The hard drives can be selected by path in the main program window. The method used to prevent power saving mode is to keep the hard drives busy in regular intervals. The default interval is set to two minutes. The setting can be changed in the interface as well, and you may play around with the setting somewhat until you find the sweet spot for your device. I suggest you experiment with the interval until you find the most suitable one for your hard drives. If your hard drives enter sleep mode after ten minutes of inactivity for example, you may set the interval to nine minutes to avoid unnecessary writes and activity. External hard drives may enter power saving mode (sleep) after being idle for some time. The guide explains how you can prevent that from happening.